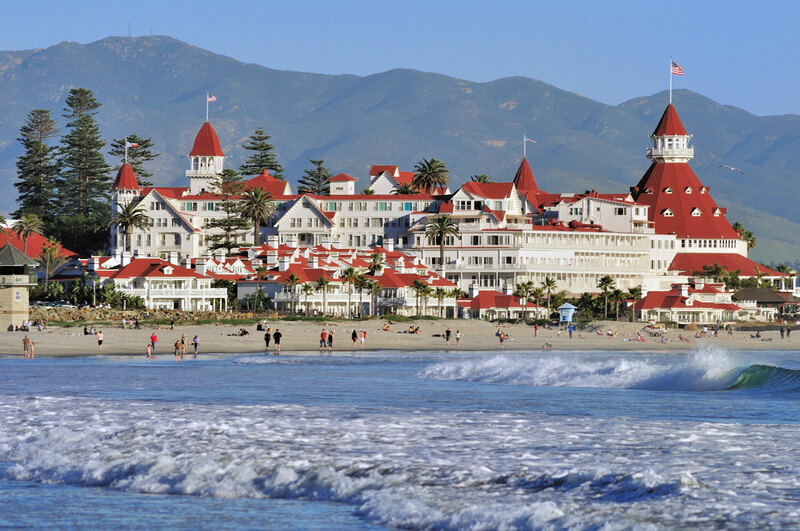 The Hotel del Coronado, established in 1888 in Coronado, California. Marilyn Monroe on the set of Some Like It Hot in front of the Hotel del Coronado. Views of Coronado Beach from the Hotel del Coronado. Photo by Kimberly Budziak. 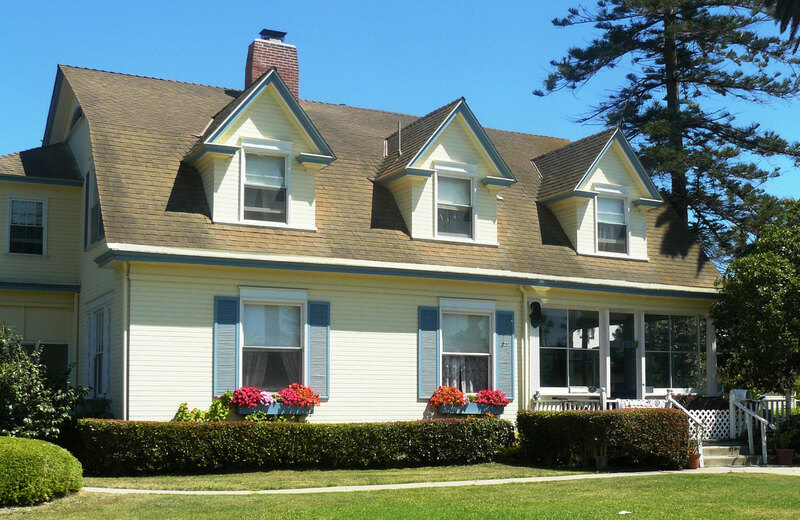 Wizard of Oz author L. Frank Baum’s home in Coronado. 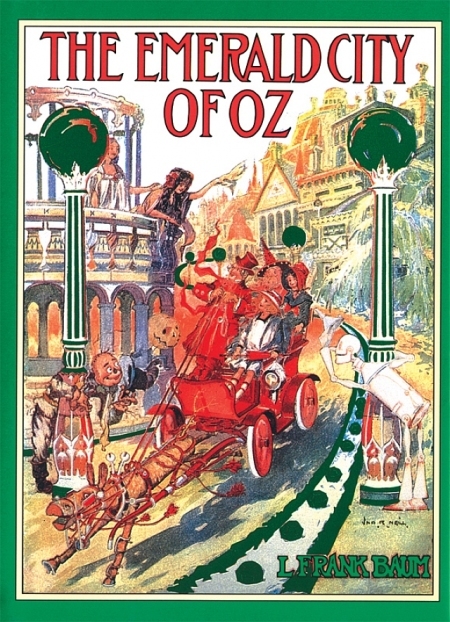 The Emerald City of Oz was one of four Wizard of Oz books L. Frank Baum wrote during his days in Coronado. 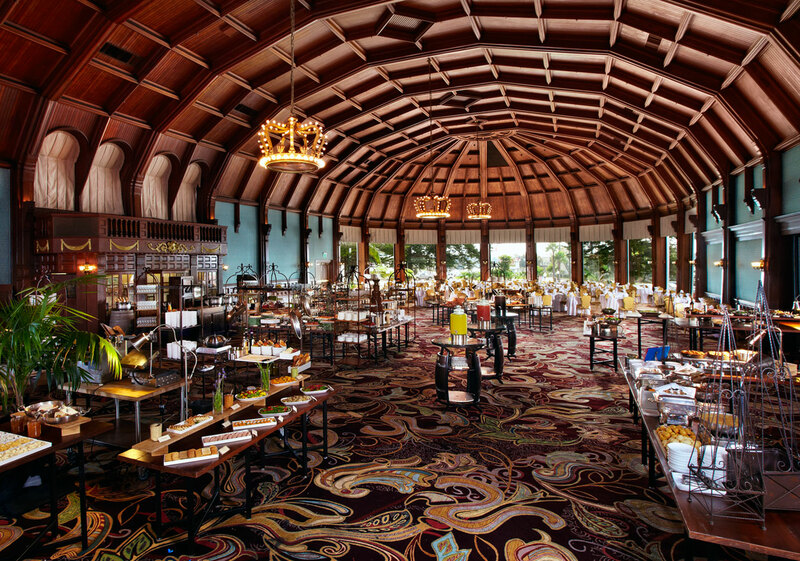 The Crown Room at the Hotel del Coronado, set up for Sunday brunch. 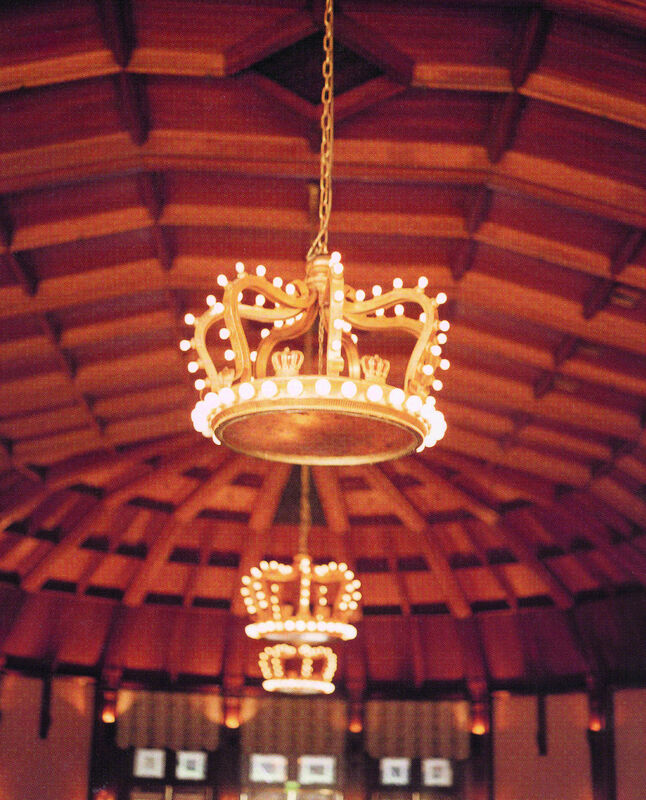 The pendant lights of the Crown Room at the Hotel del Coronado were designed by Wizard of Oz author L. Frank Baum. 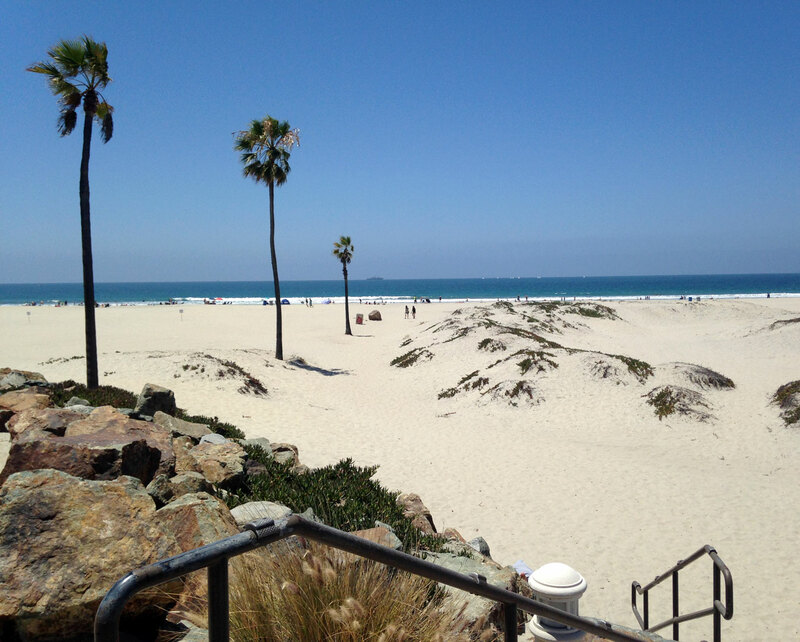 The white sand beaches of Coronado. Photo by Kimberly Budziak. 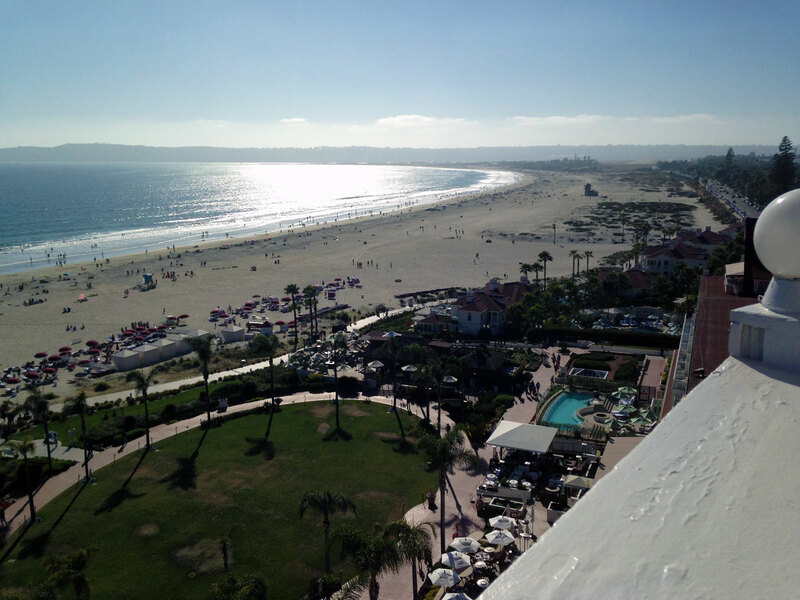 Views of the Hotel del Coronado’s inner courtyard, Coronado, and San Diego in the distance. Photo by Kimberly Budziak. 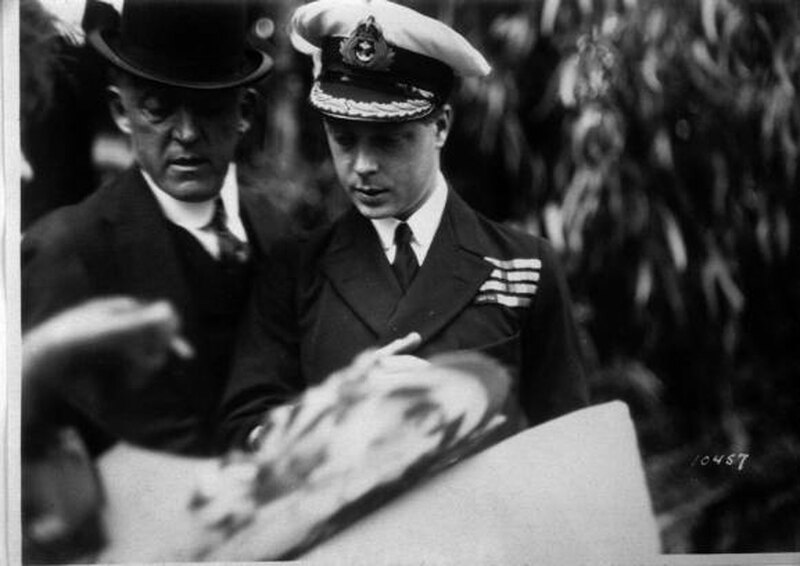 Edward, Prince of Wales at the Hotel del Coronado, 1920. Had it not been for these occurrences, it is unlikely that the Cape Cod–inspired beach bungalows of the last few decades would stand, with their welcoming verandas and patriotic star-spangled banners. Nor the Midwestern Victorians unassumingly placed beside them, with miniature turrets and red roofs paying homage to the grande dame hotel of the same style only blocks away. Forget the 21 parks, dedicated Navy SEAL training grounds, and 130-acre municipal golf course. Nor would the iridescent shores of the Silver Strand State Beach, named for the traces of silver seashells that blend with its white sand, be as wide. Nancy Cobb, co-founder of the Coronado Touring historic walking tour, enlightens a small group gathered in the antique music room of the Glorietta Bay Inn on the lengthy history of the small peninsula and the tenacity of its founders, including the boutique hotel’s previous owner (and Coronado’s most enthusiastic benefactor), sugar magnate John Diedrich Spreckels. Having experienced the 1906 San Francisco earthquake, Spreckels enlisted architect Harrison Albright to design a tribute to Italian Renaissance, complete with a generous amount of reinforced steel and concrete. A marble staircase leads guests upwards towards the charming suites; this 11-room mansion is the centerpiece of the Inn, which also houses 89 rooms in the contemporary buildings surrounding it. It was from here that Spreckels made it possible for Coronado to be home to many, giving the city its library, largest commercial building, and several parks. 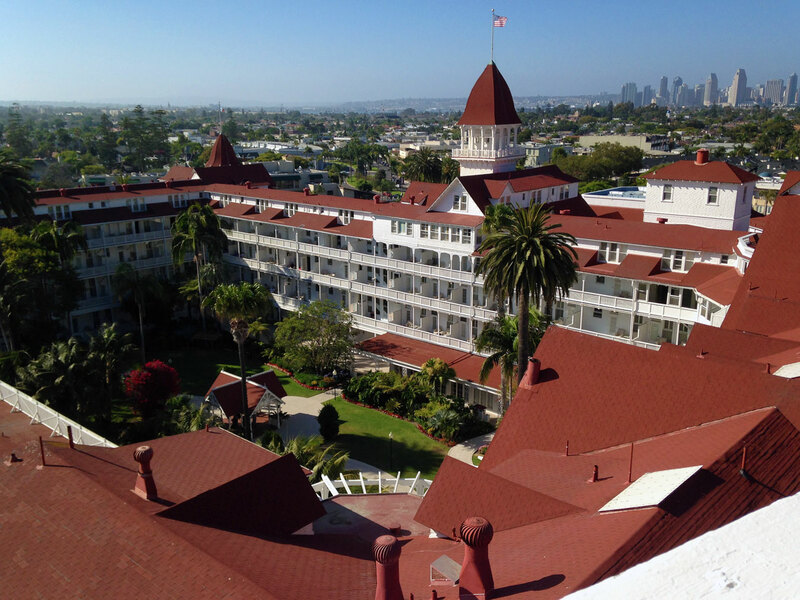 Across the street sits the jewel of Crown City, the Hotel del Coronado. The birth of Coronado itself is tied entirely to the hotel, which today is as much an attraction as it is an accommodation. It was in the mid-1880s that two retired Midwestern businessmen, Elisha Babcock Jr. and Hampton Story, conceived the idea for a resort island community with a grand seaside hotel. As San Diego’s economy was beginning to boom, the duo pounced on the opportunity to lure in America’s wealthy Victorians, securing funding from investors to purchase the land. “The Del”, as the hotel is known, opened in 1888, just one year after construction began. The recently-renovated lobby holds traces of a bygone era: the cage elevator is still attendant-operated and the historic Crown Room’s domed ceiling features pendant lights designed by Wizard of Oz author L. Frank Baum, who lived nearby. The Del, and Coronado at large, are said to be the inspiration for the Emerald City. Outside, the grounds of the hotel are expansive and tiered; shops and lookout points are frequented by visitors enjoying the balmy weather and surrounding flora, much of which was imported—with the desert landscape of Mexico within sight, one can understand why. Australian trees are planted nearby tropical Birds of Paradise, and a dragon tree native to the Canary Islands has a plaque that boasts its small background part in Some Like It Hot. 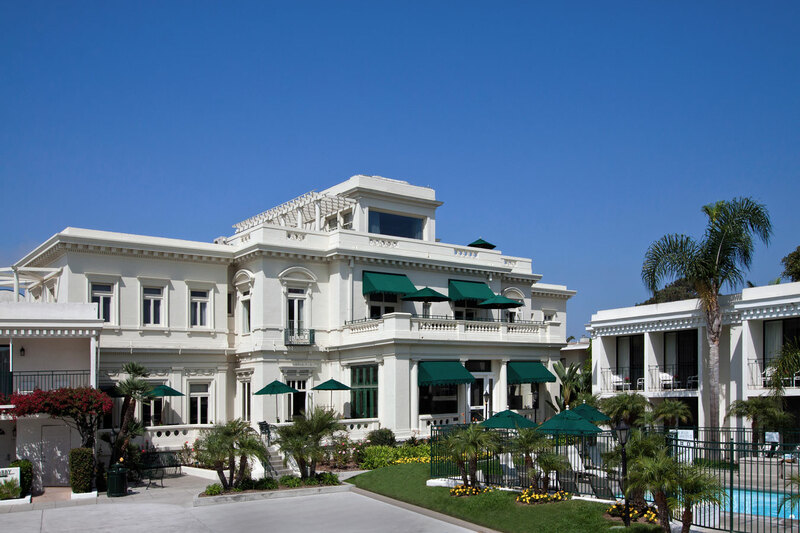 Marilyn Monroe, Tony Curtis, and Jack Lemmon have all visited Coronado, as well as 11 United States presidents, including Roosevelt, Nixon, Carter, Reagan, and Clinton, many of whom stayed at the hotel compound. Over time external buildings were added to the property, and although all have matching rouge tops, their decades show. The apartment towers are mod in style, while the beach cottages are of this generation and are frequented by stars of a more modern era, such as Al Pacino, Jennifer Garner, and Robert Downey Jr. Many rooms offer picturesque views of sparkling white Coronado Beach and the ocean beyond. The harbour had been dredged many years ago to make way for boats, its sediment cast out to sea. Little did the island’s developers know, the ocean current carried those deposits back to land, over time forming the now expansive shoreline. From the hotel, heading north towards San Diego, stretches Orange Avenue, where independent shops and restaurants offer neighbourly welcomes. If Smalltown, USA does exist, this is it, as is evident right down to the updated comfort food like the truffled grilled cheese at Leroy’s Kitchen + Lounge. 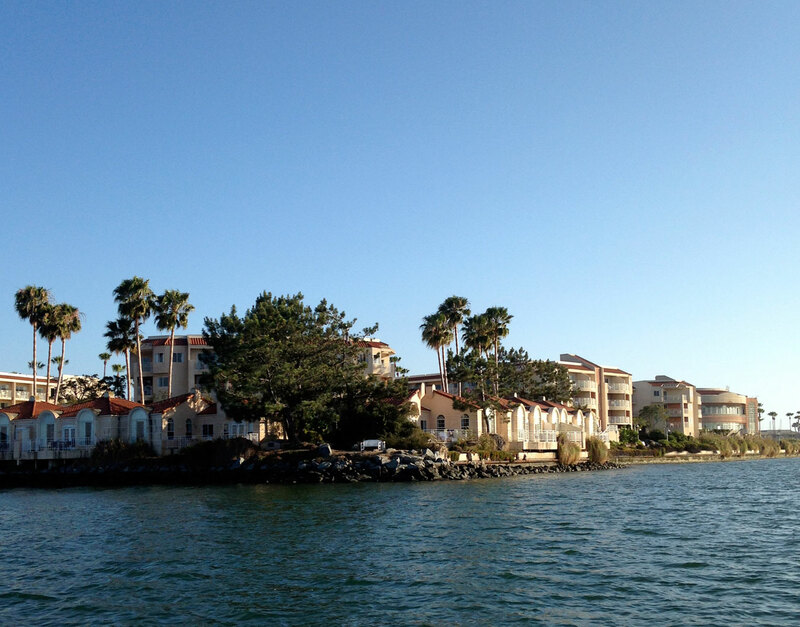 A short drive south from the downtown area, past the naval base and fenced-off SEAL training beach is Loews Coronado Bay Resort. If the city did offer hustle and bustle, this downwind property on the bay would be the place to escape it—sailboats, private poolside cabanas, and enticing cuisine by chef Adam Cho are at the ready. While San Diego hosts more than 33 million visitors each year, Coronado remains relatively unknown to many travellers, held cautiously close by those lucky enough to have escaped here. And while some keep mum to preserve its genial disposition and others decide its charms are too enticing to stay secret, a select few are lucky enough to come across it by happenstance, venturing over the curved bridge from the city, onto a small strip of land with a big story.